Monuments, if designed and built well, can be a distinctive piece of signage for the end-user. They can also be a distinctive offering for the sign shop willing to venture into this field. However the idea of using stone, concrete, and brick for the build and install can seem an intimidating prospect for some shops; the good news is that the appearance of these features can be replicated with less weight and at less cost. Located in San Jose, California, Signs Unlimited has been designing, fabricating, and installing monument signage since 1991. However Owner Kevin Kavianian has seen quite an uptick in these types of projects over the past decade. From an architectural design standpoint, Kavianian has found that foam-core/synthetic stucco monuments offer much more flexibility. “Contours and very-custom designs can more easily be accommodated with foam monuments than with metal structures,” he explains. Kavianian says that, with foam-core, you can produce substantial-looking masonry, concrete, stone, or brick designs that are far more cost-effective than using these actual materials. “The monument’s weight is another big factor especially, as signs have to be loaded and transported to the installation site,” says Kavianian, noting that that, thanks to EPS foam (and HDU), installation is much more economical and straightforward, which results in huge savings in the cost of the project. Timber Cove. This particular project presented a unique challenge from the onset. 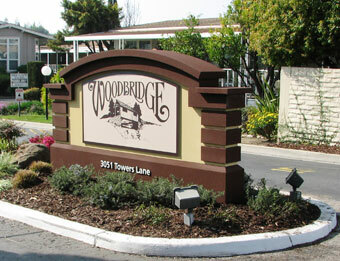 The property initially had been using a main wood sign that was partially built on natural redwood tree trunks; however this sign piece had been removed, and the owners were looking for an updated version of this sign that was more resistant to rot and termites. The shop recognized that EPS foam-core was one of the only viable options in this scenario, so they worked closely with Peachtree City Foamcraft to design the monument sign elements to make sure they were in sync with the manufacturing requirements of this unique-looking sign. “We had to use an old, rough logo lifted straight from the client’s letterhead to create a design that would mimic the older look of the previous sign,” says Kavianian. This finished vertical panel pieces were router-carved to resemble redwood and painted with 100 percent latex enamel. Woodbridge. The owners of this townhouse complex desired an upgrade of an already-existing post-and-panel sign. “The property management company wanted a more traditional look for the new monument here, as opposed to a modern design that is more popular in the neighboring Silicon Valley area,” says Kavianian. The decision to use foam-core was based on the fact that this material allowed Signs Unlimited to create a more traditional-looking yet still-substantial structure than is typically done with aluminum cabinet-type monuments. The property logo was digitally produced and installed on the monument using flat panels within the indented area designed for this purpose. Mountain Springs. This sign for a manufactured home property in California won First Place in the “Freestanding Sign, External or Non-illuminated” category in the 2016 USSC Sign Design Contest. “The client wanted a sign that was in line with the ‘Mountain Springs’ theme,” says Kavianian, “however they did not want images of a mountain on a rectangular-looking monument. Instead of foam-core, Signs Unlimited used high-density urethane to come up with a suitable design and create the type of surface that would help visualize an actual mountain and stream. By using modern technology, Peachtree City Foamcraft was able to simulate the appearance of a sandblasted sign or a traditional wood sign without the need for a blasting booth. Not only is this more environmentally friendly, but it allowed them the opportunity to produce a more consistent product. Signs Unlimited mounted the monument panel using painted pressure-treated redwood posts that were carved out to receive the foam-core monument panel. Property management added external-illumination spotlights at its base. Signs Unlimited was established back in 1991 designing, manufacturing, and installing a wide variety of signs and graphics—ranging from internal architectural signs to large externally illuminated signs—for businesses in the San Francisco Bay Area. Today the company provides a complete repertoire of high-quality, competitively priced sign solutions and services for its clients, which include small, local businesses all the way up to large, multi-national corporations. Kevin Kavianian purchased Signs Unlimited over a decade ago, after spending twenty-seven years in Silicon Valley working in electrical engineering, high-tech marketing, and product management careers. Signs Unlimited is a fully independent member of Signworld (signworld.org), a nationwide family of sign companies. This affiliation proved very beneficial to Kavianian. 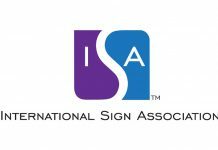 “[It] enables us to provide installation support and services across the entire country, which simplifies sign projects for companies with multiple locations,” he says. Another thing that all the owners of Signs Unlimited have done since opening their doors over twenty-five years ago is ensure that their employees are cross-trained. This means that each one can perform the duties of others, whenever the need arises. Options for decorating EPS foam/synthetic stucco monuments vary and can include dimensional lettering/logos, digital print graphics mounted onto panels, and factory-embossed and painted faces. He warns that, generally, the more text, copy, etc., one includes in the design, the more busy and unreadable the monument sign will become. Kavianian recommends only using what re-enforces the client’s brand and whatever else they want to communicate to the viewer such as name/logo, business type, or location. Kavianian states that contour-cut vinyl graphics cannot be directly installed onto foam monuments, due to the nature of the material’s surface. “We typically mount the printed vinyl onto aluminum panels that match the background color of the monument,” he says. When it comes to illuminating the monument, Kavianian finds that most clients use external lighting, like spotlights. But Mike Fetter of Peachtree explains that LED lighting can also be added into a sign. “We can customize ventilation for the lighting (or the LED message center) to accommodate the interior/exterior structure,” he says.